Atlanta Forklift Certification, Get Easy Training Now! Atlanta’s strong economy and growing population contribute to the city’s thriving business sector. Forklifts are used in a wide variety of projects throughout Atlanta, and giving your employees forklift certification in Atlanta means that you will meet all OSHA training requirements. ForkliftCertification.com is your training partner for Atlanta forklift certification. Our affordable courses will get your employees OSHA compliant. Best of all, training is convenient and affordable! 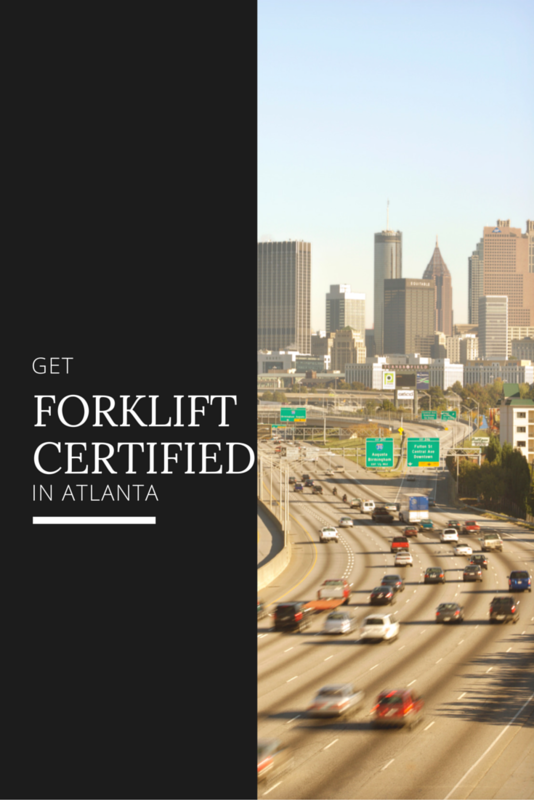 Sign up today and see how we can help with forklift certification in Atlanta! Some of the top companies that hire forklift workers in Atlanta include Coca-Cola and the headquarters of Bell South, Delta Airlines, Home Depot, UPS, Georgia-Pacific, and other Fortune 1000 corporations. With prospective companies like these, Atlanta is one of the best cities in the U.S. to work in with a forklift certification in Atlanta. Before you hire a forklift operator, make sure they have their forklift certification in Atlanta. We’ll help with all of your Atlanta forklift certification needs! Not only is forklift certification in Atlanta important to appeal to prospective employers while job hunting but it’s also a necessary component for employers to remain OSHA compliant. Forklift certification in Atlanta is the most effective method for preventing accidents that can cause serious injuries and fatalities involving forklifts. OSHA’s made it their mission to reduce workplace accidents, and training is one of their top standards they take the most seriously to tackle this issue. According to OSHA, it’s an employer’s responsibility to ensure workers are able to operate forklifts safely and properly, following the successful completion of training. Most companies can’t handle this task alone – that’s why ForkliftCertification.com is the preferred choice for Atlanta forklift certification! Once a worker goes through our Atlanta forklift certification, employers will have the qualified workers they need to combat fines and legalities. Where can you find a program such as this, that doesn’t cost hundreds of dollars? At ForkliftCertification.com! HOW DO I GET MY FORKLIFT CERTIFICATION IN ATLANTA? It’s easy! If you’re an employer, all you have to do is register your company and have your employees create their own log in accounts to access the modules. They’ll be able to work on their forklift training at their own pace, from any device with an internet connection. At ForkliftCertification.com, we have made it easy, convenient, and affordable for workers to complete the OSHA-compliant forklift certification in Atlanta they need to qualify for their dream job. We offer three different equipment-specific classes for workers to choose exactly what training they need. With each initial forklift training course, your workplace will get three-year renewals for life! You can also bundle and save with our Bundle Package, to receive the Training Kit and Train the Trainer course to get your own in-house trainers. We’re ready to help with your Atlanta forklift certification right away! Get started today and find a great, new career with forklift certification in Atlanta!